Whenever you are using your spot meter. Zoom in to the area you want to spot meter, set your exposure manually, and you have it set until lighting conditions change. For Exposure Compensation more than 2 Stops. In many camera models, aperture priority and shutter priority modes limit your exposure compensation of 2 stops in either direction (some models give you 3 stops). This is plenty for most situations, but on those rare occasions when you need to use more than what your shooting mode allows, you'll have to switch to manual mode. Panorama shots. When shooting panorama shots outdoors, you put your camera on a tripod and take several shots, rotating the camera between shots. You want to end up with several images that overlap, so you can stitch them together on your computer with software. When you do this in other modes, your exposure values will change between shots, so where the images overlap, the exposure may well not match up. By shooting in manual, you ensure that your exposure will stay consistent throughout each image. Now be careful here. There may be enough contrast in your scene so that one image will become so overexposed or so underexposed that it will defeat the purpose of shooting a panorama. If you find yourself in that situation, shoot the same scene several times with different exposures. If you need to, you can let your software work on fixing the exposure values between the images. Manual mode works in a way that's very similar to aperture priority and shutter priority modes. In these modes, you use one dial to set either the aperture or the shutter speed, and you use a second dial (or the same dial while pressing a button) to set exposure compensation. In manual mode, one dial will set the aperture and the other dial (or the same dial with button depressed) will set the shutter speed. As you set the exposure, set one exposure factor to where you want it and then set the other to what will give you the proper exposure. Suppose that you are shooting a sunrise. You set your camera to spot meter and zoom in to the brightest part of the sky without the sun in the frame. You want to make sure you have enough depth of field to keep your foreground and background in focus. So you can set your aperture to f/16. Then turn the dial that controls shutter speed until your exposure scale reads somewhere between +1 and +1.5 stops. Zoom out, recompose and shoot. Then check your preview screen. If you believe your image is overexposed or underexposed, you do not need to go through the whole process again. Simply change your shutter speed by 1/2 stop or 2/3 stop and shoot again. It's really that simple. This, I believe, is the easiest way to shoot a sunrise so that you can have confidence that you will get the results you want. 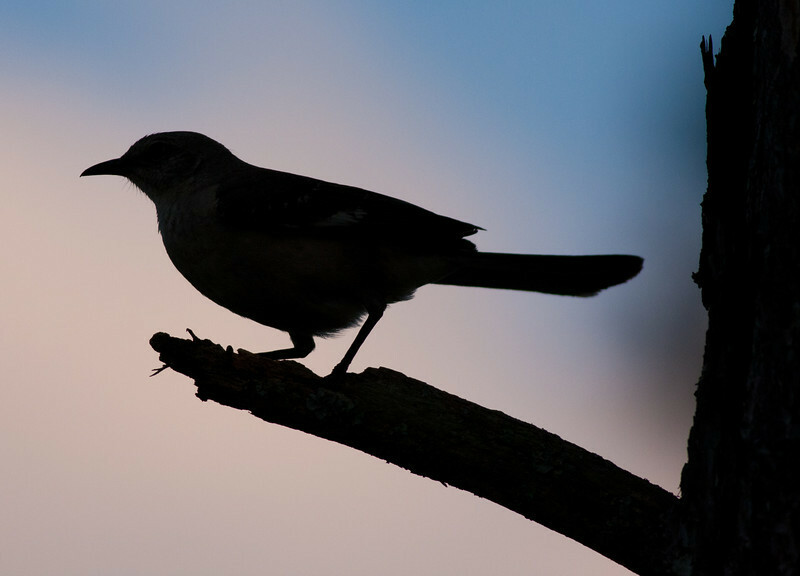 For the above photograph, I wanted the mockingbird to be a silhouette so that all the color would come from the background. To get this shot, I had to be quick, so I didn't take the time to change to spot metering. I simply switched my camera to manual mode and filled the frame as much as I could with the bright part of the background and set my exposure. Then I recomposed and shot. Thankfully the mockingbird stuck around long enough for me to get a couple shots.